Inspired by the indie game-jam spirit, a group of industry veterans have come together to form a new mobile development team called Fixer Studios. Spearheaded by former PopCap Games manager Avery Alix, the “collaborative cloud” development team is made of a volunteer workforce, where members can join and scale the scope of their work based on their individual availability, previous experience and desire. The team is comprised of around 30 members, but that number changes based on the availability of team members. The company is self-funded, and as members join or leave the group, the rest of the team reassesses current tasks to keep development on track. 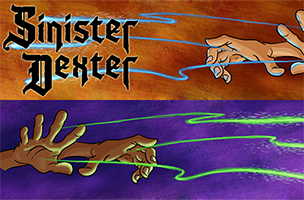 Fixer Studios’ first game, Sinister Dexter, is the spiritual successor to the pen-and-paper game Spellbinder, created by Dr. Richard Bartle over 30 years ago. The game sees wizards engaging in turn-based battles, as players can activate recipes from their spellbooks using hand gestures for each spell. As players complete battles, they’ll earn experience points and will unlock new characters, equipment and customization options to make their wizards stronger. Sinister Dexter is expected to launch on iOS and Android devices in late Spring 2014. We had a chance to chat with Avery Alix [pictured], Director of Fixer Studios, about the company’s goals, and what players can expect from its first game. Inside Mobile Apps: What inspired the formation of Fixer Studios, with its focus on a volunteer, ever-changing workforce, as opposed to the formation of a traditional game development studio? Avery Alix: Well, the truth is that we formed organically to best support our first passion project. The fifth person to join our team was taking the autumn off to spend more time with his children and thought contributing to Sinister Dexter would be a pleasant side project if we could work flexibly with his schedule. We jumped at the chance to work with an art director who has more than a decade of industry experience, and even at about twenty hours a week he still managed to drive Sinister Dexter’s art style and produce a lot of great illustrations. We pivoted to our current structure once we realized that flexibility was the key to attracting top talent we couldn’t get to sign up otherwise. IMA: Every member of Fixer Studios is encouraged to participate in all facets of app development, correct? How do you feel that improves the final product that reaches the market? AA: Foremost, I think Fixer Studios is an enthusiasm-driven machine. By being completely transparent and collaborative in decision making, every team member has reason to feel very connected to the project and empowered to make sure they’re proud of it. Further, there are lots of examples of multi-talented folks on the team making great contributions outside of their core skill set. As a team member, if you have the enthusiasm, time and talent to deliver any kind of task, then we say go for it! For example, our business lead is a professional marketer in the games industry, and after forty (or sixty) hours a week at the day job he was looking for a good reason to occasionally practice his other passion – music. So, not only is he helping the business team, he’s also composed Sinister Dexter’s score. AA: Honestly, the talented individuals of the team can take more credit for that than our organizational structure can. First, our open and respectful communication works well within our team to resolve any outright disagreements quickly and to the benefit of the project. Also, leads like Eric Olson have strong management experience from other gigs, and work with their teams to ensure that everyone feels efficient and productive.